This past week at Kitt Peak National Observatory, I renewed my first responder certification. 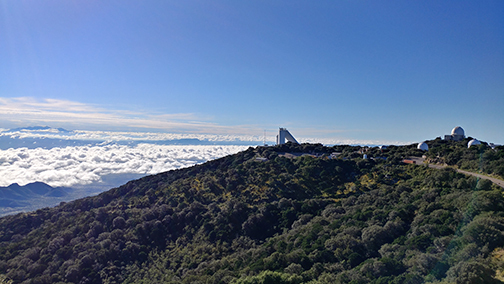 As I mentioned in my Saturday blog post, observatories are in remote locations and bad things do happen. I’ve been fortunate enough that I haven’t had to deal with much in the way of criminal activity at an observatory. I’m often asked if I have ever seen aliens at the observatory. My answer to that is that the law enforcement agency I’ve interacted most with at the observatory is the U.S. Border Patrol. That said, things can be bad enough without people engaged in illegal activities. I have had to treat an astronomer who was stung by a scorpion. I also know of a time a person on the mountain suffered a heart attack, though did not go into cardiac arrest. As I approach the age my father suffered a fatal heart attack, I find myself grateful that many of my co-workers know CPR and have been trained in the use of Automated Electronic Defibrillators. Even without worrying about heart conditions, I have also had more than my share of accidents. About a month before my oldest daughter was born, I was working on a telescope when I accidentally knocked a 15-pound weight off a ladder and it fell right into my jaw, puncturing my lower lip. Luckily I didn’t lose any teeth. More recently, an elevator became stuck. We were able to open the door and I jumped to the floor below to go find a ladder to get my fellow passengers out. I managed to sprain my knee in the process. At Kitt Peak National Observatory, once we dial 911, it will take 45 minutes for the closest ambulance to make it to the observatory summit. Many observatories are even further from emergency response. Having a staff where many people have first responder training means we can help each other and help visitors during emergencies. I strongly encourage you to get first responder training if it’s at all available. 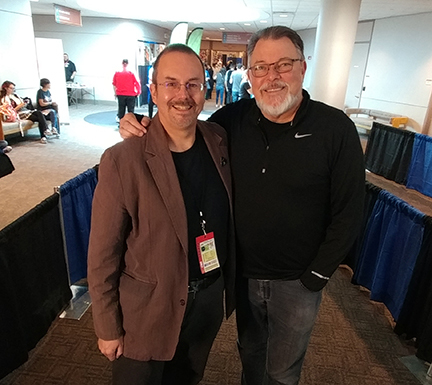 I have to admit, I don’t always remember all the lessons from the videos and practice sessions, but the training does give me the confidence to follow instructions from a 911 dispatcher when I call. I’ve also found that in those rare emergency situations, I’m surprised by how much I do remember. Another aspect of first responder trainer that’s important to me is that it gives me experience I can draw on as a writer. 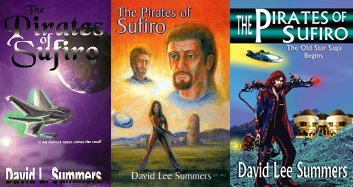 Aspects of both Kitt Peak’s remote location and the training I’ve received as a first responder have gone into such novels as The Pirates of Sufiro. The novel is currently out of print, but I’m about to launch into a full rewrite in preparation of a fourth edition at my Patreon site. My Patreon site also helps to fund this blog and I currently have an initiative to raise enough money to upgrade this to an ad-free site. 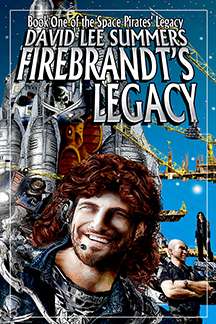 Drop over to my Patreon site and read two free stories of my new collection Firebrandt’s Legacy. If you sign on, you can read the rest of the collection for free, plus you can see how The Pirates of Sufiro develops in its new edition. I bet you’ll even see some examples of how I put my first responder training to use in my fiction writing. 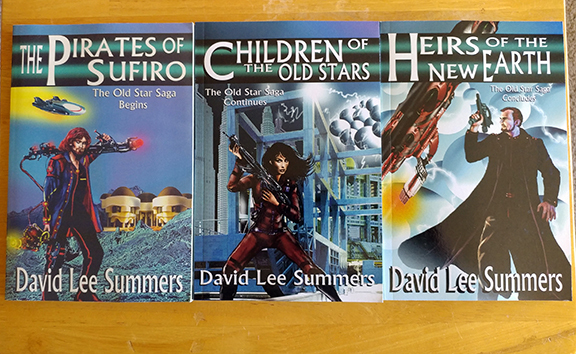 My Patreon site is at: http://www.patreon.com/davidleesummers. In many ways, steampunk is more than a literary genre and more than a fandom. It can be a lifestyle and it can be a community. I experienced this when I joined the Tucson Steampunk Society to invade the mining town of Bisbee, Arizona, just a few miles south of Tombstone. 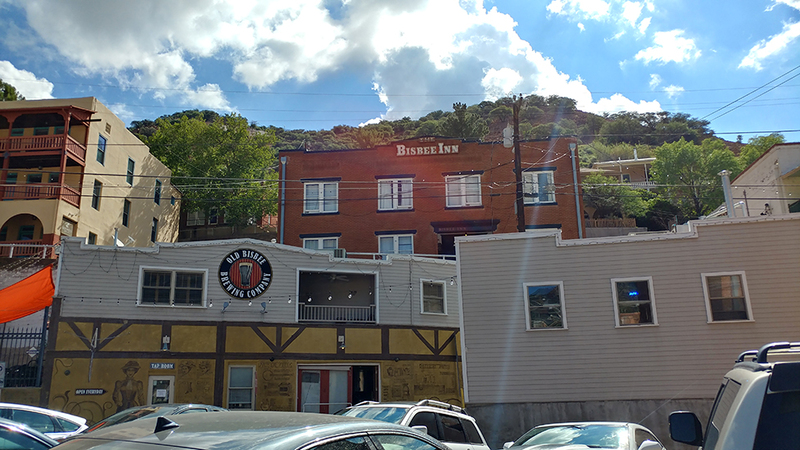 The Society secured lodgings at the Bisbee Inn, also known as the Hotel La More, at one edge of Bisbee, overlooking Brewery Gulch, a home to saloons in the old west days and still a home to some fine breweries today. The Bisbee Inn is a lovely building that still feels very much like a nineteenth century hotel, even with its modernized plumbing and kitchen. Unlike a convention, this outing was not jammed full of scheduled items. Most events happened on Saturday, August 18. We started with a meetup at the Cafe Cornucopia for an informal lunch. Afterwards, from 1-5pm, the League of Pythean Metachronists and Explorers of the Paraverse welcomed participants to a High … very High Tea in the far reaches of the Mule Mountains. Many participants hiked into the Mule Mountains for tea and adventure. Some remained below at the base camp, still others took the time to explore the shops and attractions of Bisbee. My wife, daughter, and I decided to take the Queen Mine Tour, which is quite an adventure in itself. The Queen Mine was a copper mine that operated as recently as 1975 and our tour guide was one of the miners who worked there. 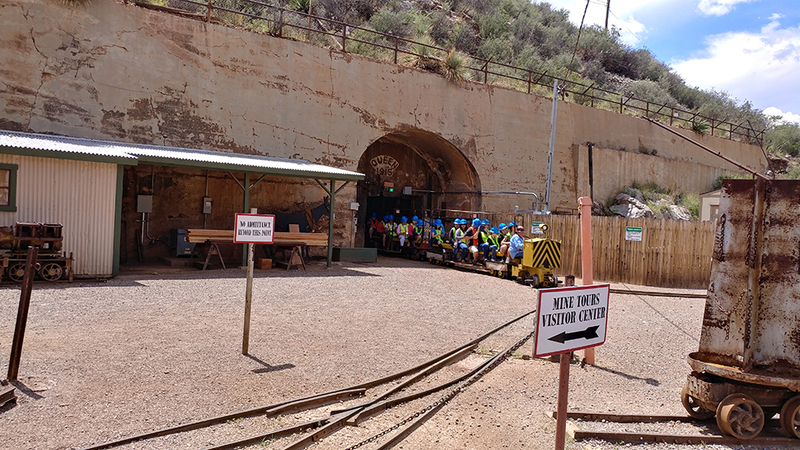 The people who take the tour are loaded on a little train that rides along the old mining cart tracks deep into the Earth. There, the guide gave us a look at the equipment used in the mining operation and regaled us with anecdotes of his days working in the mines. I last took the tour circa 1994 and information I gained was used when I described the Erdonium mines in my novel The Pirates of Sufiro. I’m getting ready to start my rewrite of that novel at my Patreon page, so you can bet the fresh visit will be useful! After the mine tour, I joined the family for a visit of the shops. Va Voom near the Bisbee Inn specializes in many steampunk items and held a no-purchase-necessary raffle for a beautiful leather parasol holder. All of us found treasures in the store to take home with us. After that, we took a break until dinner time and had a nice, quiet dinner as a family. Bisbee is the kind of town where you can walk into a fine restaurant in your steampunk best and be welcomed with open arms. The group did elicit a few comments, and though a few were puzzled or curious, most were complimentary. After dinner, my family and I visited a few more shops before rejoining members of the Society for gelato. We then returned to the hotel for the PG PJ Potluck Parlour Party. This was a chance for steampunks to gather and mingle. I was invited to read and the hotel, like many old hotels, is said to have its share of ghosts, so I read a sampling from my story “The Sun Worshiper” about a mummy-unwrapping party gone wrong, which appears in the anthology After Punk published by eSpec Books. 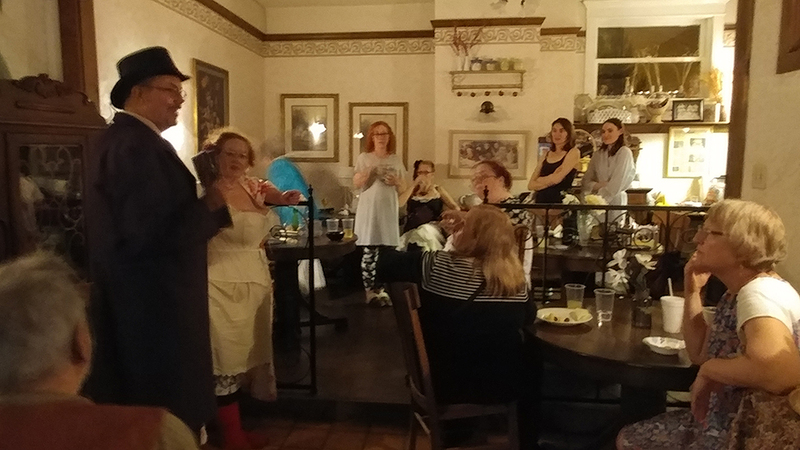 You might notice in the photo that I wore a top hat and tails to a PJ party. Of course, as an astronomer, that is viable late night wear! After the reading, the party moved on to a mix of tarot and tea leaf readings plus some party games. The whole thing wound down between midnight and one in the morning. All in all, it proved to be a wonderful and relaxed time. It gave me a chance to know members of the Tucson Steampunk Society better than I would have at a convention. What’s more, when I go to a convention in a town, I rarely have time to actually explore the town. I loved that I got to spend time in Bisbee, visit its shops and see some of the people who weren’t part of the event, including a dear friend who lives there and another friend who was in town for a different event. I would certainly be happy to return for another such event either in Bisbee or in a new and different location.